No Trees To Slack On? We Have A Solution! 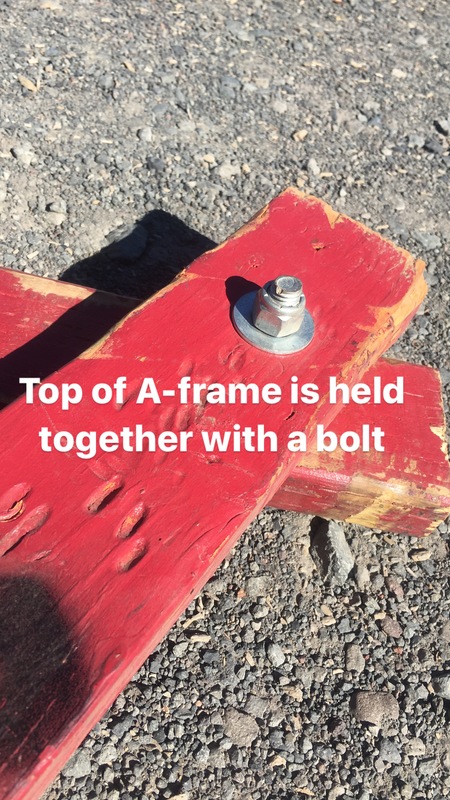 Recently, someone reached out to me wondering if I had any advice on how to build an A-frame anchor system. They wanted to know how to set up a line with no trees around to act as anchors. I got inspired and took some pictures of the A-frames up in my front yard. The photos are of some classic Yogaslacker A-frames. These are not the only style of A-frames out there, but they are simple to make and easy to set up. The height and thickness of your boards is up to you, but I would recommend using a 2 x 4 or 2 x 6 to get started. I would also recommend cutting your boards about 4 foot long if slacklining is new to you. Otherwise the general rule is the longer the line the taller the A-frame. Do you see the rope at the bottom of the boards? That’s there to make sure the boards hold their triangle shape. But we’ll get to that in a minute, first lets take a look at how you connect the boards at the top. Stack two boards on top of each other and drill a hole in the top center of the boards. This hole is where you put a sturdy bolt and a locking nut to secure the boards together. I recommend using some washers here too. Drill a hole, plug it with a bolt, washers and a nut. Use a locking nut, so it doesn’t back off on you while in use. Now let’s get the rope out and measure for our cut. First, open the boards so that they form the top the top of a triangle. Then take your rope and complete the bottom portion of the triangle shape. Measure your rope from the center of one board to the center of the other board. Then add a little extra for making your knots. Cut both ropes to the same size. Now drill a hole at the bottom of the boards, run your rope through and tie a knot in the ends of the rope. A simple knot so the rope doesn’t slide out. That covers most of the construction part…now you have to grab more supplies. 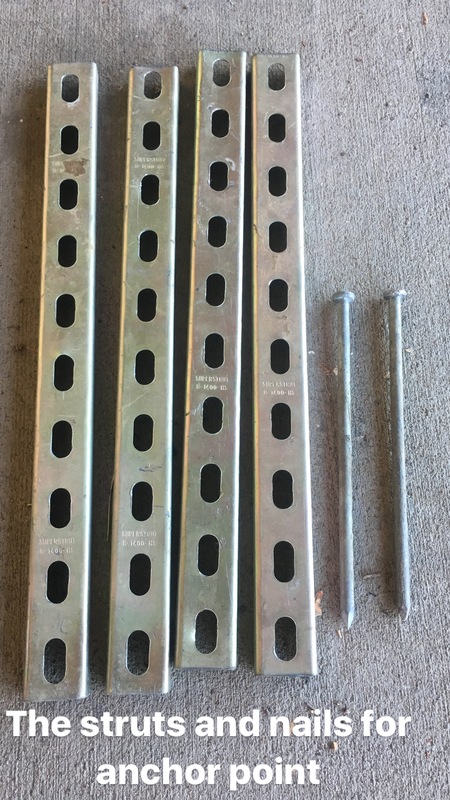 You’re going to need some super strut anchors and some 12″ nails. The super strut usually comes in longer lengths, so you might have to cut them to size. I suggest cutting them into 2′ lengths, and you’ll need 2 struts for each end. Sometimes yards with softer ground may need 3 struts per side. A little bit of metal to get the job done. These brackets are called Super struts. Equalize the load to pull from both struts evenly. As far as nails go, you will need two or three nails per hole in the strut. I know that’s a lot of nails, but safety first right? Yes! Safety first. You might want to consider buying a heavy-duty bucket to hall your nails and struts around too. It’s nice to have everything contained together when you go to set up your slackline. 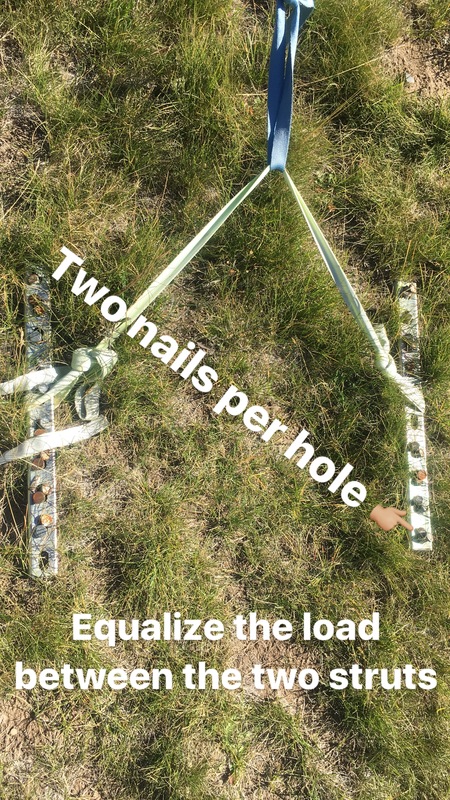 When you put the nails in, put them in at opposing angles. This helps the struts stay in place. 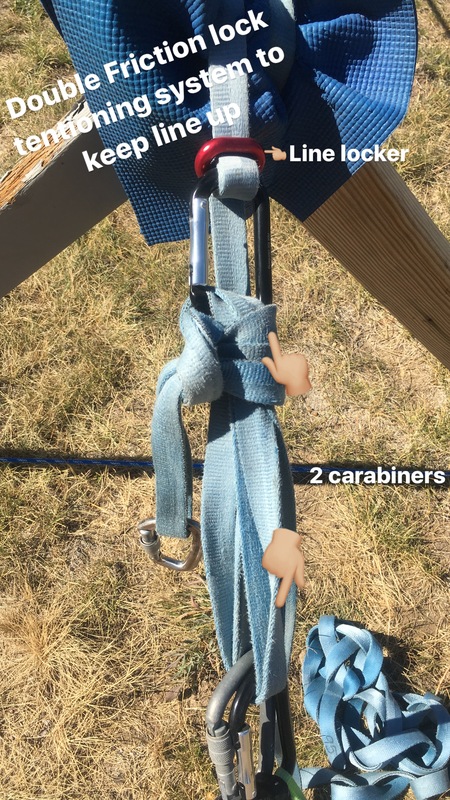 You can connect a carabiner to the strut or wrap a sling around the strut to connect to the line. You now know how to build the A-frames, how to anchor them to the ground with the struts and nails, and now it’s time to put up the line. Below are some pictures of anchor ends with 2 and 3 struts. As I mentioned earlier, sometimes you need three struts for security, depending on the ground. Be mindful of underground irrigation pipes in the yard. If you have them, this may not be the ideal setup for you… unless the water lines are buried deep enough that you won’t puncture one with the nails. 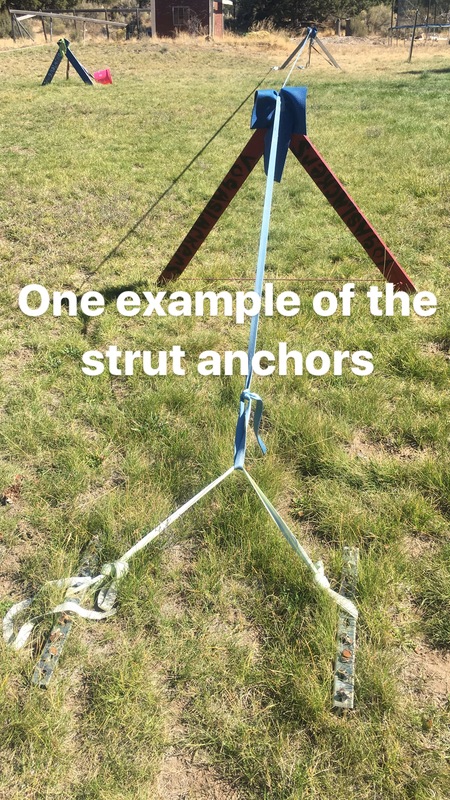 An anchor set-up with 2 struts. Another thing to be aware of is protecting your line. This A-frame design can pinch the line when you wrap it around the boards. 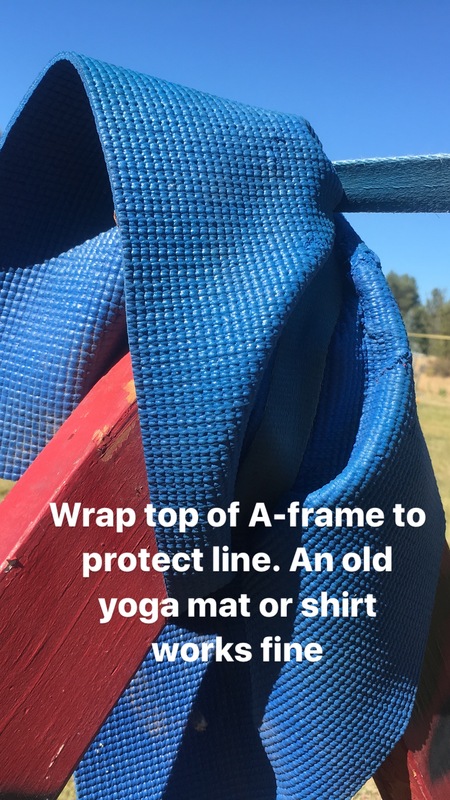 I like to take an old yoga mat, or an old shirt and wrap around the top of the A-frame covering the wood and bolts. This protects abrasion from happening to the line. 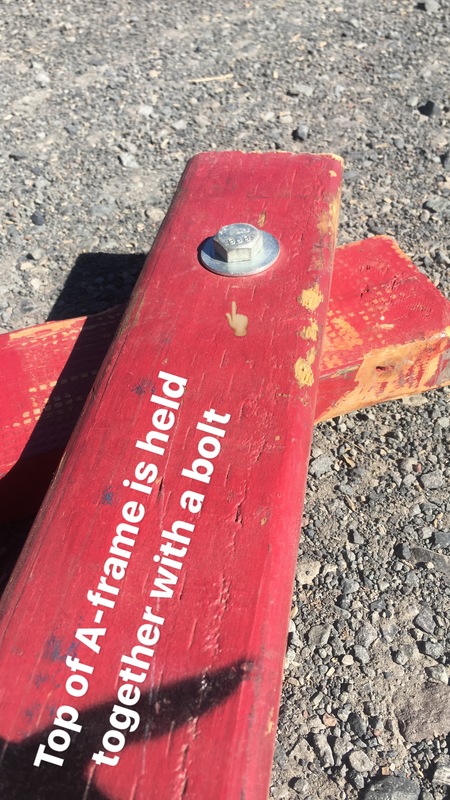 This also helps keep the slackline from getting wedged into the A-frame where the boards form an X. To keep tension in the line you can use a double friction lock technique. This is pretty easy to do and can be googled if you need a tutorial on how to do it. All you need is 2 carabiners and a line lock. If you set up lines 40 foot or less with this method there is a good chance you can tighten the line by yourself with no pullies. 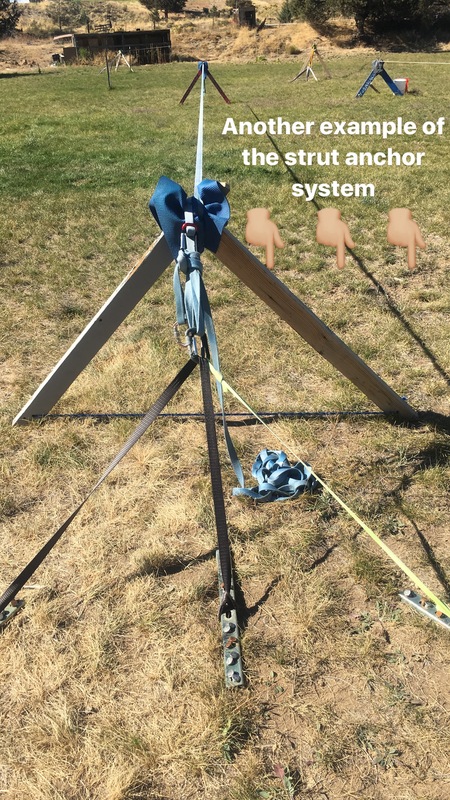 There are many more options out there for setting up a slackline without trees. Take the Slack Rack from Slackline Industries, for example. This is a simple line to set up and fun to play on. It’s a great mobile system that’s easy to assemble quickly. There are several other A-frame designs out there too. Some made out of plywood, that are flat and easy to move around. Some that are like the A-frame I showed you today, but with a middle leg added. If you’re a do it yourself type, the design I explained today is pretty simple to complete. Whatever style of A-frame you decide to go with, keep the slack strong and slack on! P.S. So now you’ve got a beautiful set of A-frames…now what? Check out our YouTube for some free tutorials and conditioning drills, or if you’re ready for MORE, you can find more instruction at SlackrobatsAcademy.com.